Explore the world’s richest musical city, starting with the legendary Preservation Hall. 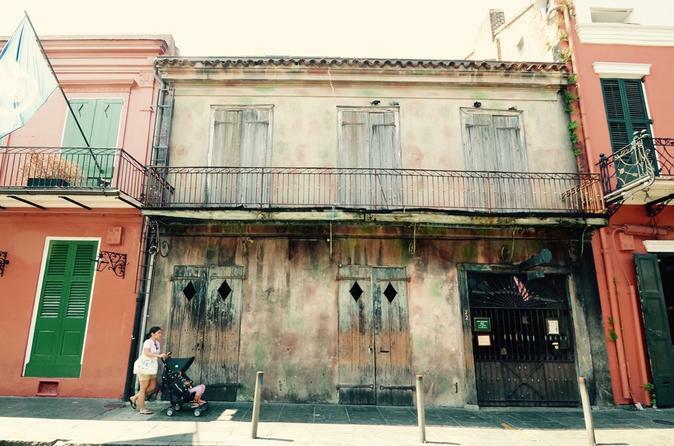 Visit the site of the Old French Opera House and stroll through the Tango Belt and May Bailey’s before arriving at the Treme section. Stroll through the Tango Belt to the New Orleans Musicians Tomb in St. Louis Cemetery #1, the use of which was donated by the musical dynasty Barbarin Family for free burial to musicians. From the cemetery you will check out the remains of Storyville (including Frank Early’s Saloon where “Pretty Baby” was written), turn-of-the-century red light district whose parlors presented King Oliver, Buddy Bolden, Jelly Roll Morton, Sidney Bechet and more during the time when jazz was born. From Storyville, venture into Louis Armstrong Park, Congo Square, the only place in North American where pure West African religious ritual and musical traditions were performed. Stroll through the Tango Belt to the New Orleans Musicians Tomb in St. Louis Cemetery #1, the use of which was donated by the musical dynasty Barbarin Family for free burial to musicians. The first burial to take place was of Lloyd Washington of the Ink Spots on October 23, 2004. From the cemetery you will check out the remains of Storyville (including Frank Early’s “My Place” Saloon where “Pretty Baby” was written), fabled turn-of-the-century red light district whose parlors presented the likes of King Oliver, Buddy Bolden, Jelly Roll Morton, Sidney Bechet and many more during the time when jazz was born. From Storyville, check out the Basin Street Station and then venture into Louis Armstrong Park, the location of Congo Square, historic site of African slave gatherings, the only place in North American where pure West African religious ritual and musical traditions were performed. Congo Square is considered the wellspring of all New Orleans music and consequently so much of the world’s most popular song. It is also the site of the first New Orleans Jazz and Heritage Festival (1970) and the Municipal Auditorium. After leaving Armstrong Park, enter the building which housed the legendary J&M Studios which created the “New Orleans Sound” with such New Orleanians as Professor Longhair, Dave Bartholomew, Fats Domino, Guitar Slim, Shirley & Lee, Lloyd Price, Ernie K-Doe, Allen Toussaint, Clarence “Frogman” Henry and visitors including Little Richard, Ray Charles, and Jerry Lee Lewis. Learn the origins of New Orleans Bounce Music and check out the world’s greatest street musicians who are carrying the flame to this very day.